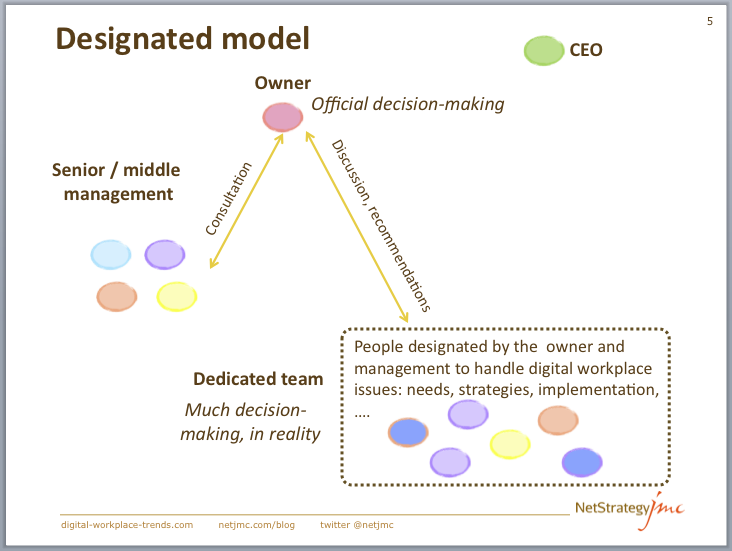 A high-level, strategic Digital Board has three areas of responsibility: decision-making, coordination and leadership. Two fundamentally different models exist for a Digital Board, each with a unique approach to the “who” and the “how” of high-level governance. This post describes the areas of responsibility in more detail, looks at the two models and offers guidance about which model best suits different contexts. The DB may make decisions or approve decisions. If the DB is at a very high level in the organization, there needs to be an operational board (middle level) that actually does the strategic thinking. 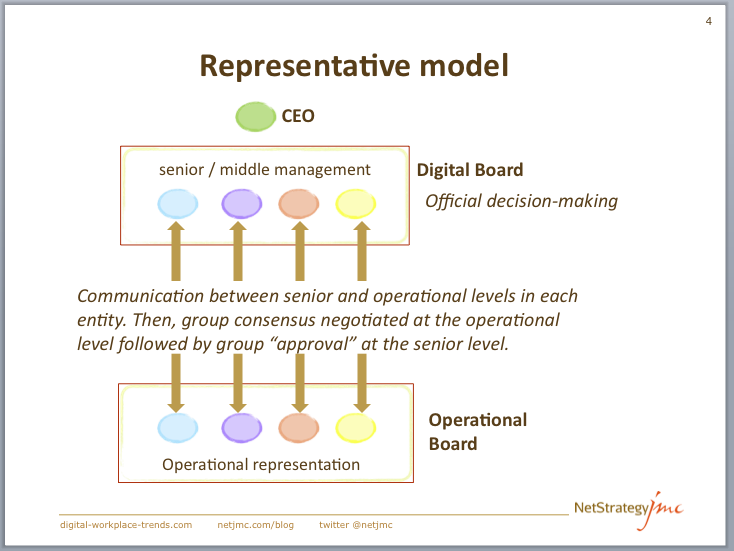 This is represented by the “operational board” or the “dedicated team” in the two models. How the digital workplace is aligned to company and business strategies. Centralized or decentralized, for different aspects. Highly governed or entreprenurial approach. Access policies: who, where, how. 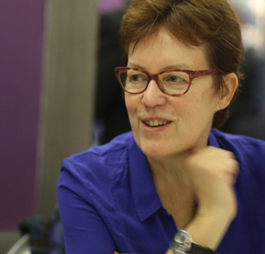 The DB must ensure that coordinating mechanisms or bodies are in place. The DB itself is a coordinating body at a high level, and similar mechanisms or communication linkages must be established at other levels in the organization. Identifying owners and roles for the different “pieces” or dimensions. The “pieces” include the managed, structured collaborative and social collaborative dimensions as shown here. Other key pieces are the company directory/rich profiles, search, mobile applications, evaluation tools, etc. Identifying ways to ensure coordination and ensuring that they are integrated into processes and job roles. This involves ensuring that evaluation techniques are used to monitor what people and the businesses need. It also involves being aware of what other companies are doing, what new technologies can offer, and how the digital world is evolving in general. The DB should be at least “on step ahead” in their thinking about where the Digital Workplace should be. The representative model is typical in organizations with strong business divisions and different activities. In organizations where the middle divisional level is as strong if not stronger than the top or corporate level, this model helps bring balance to the decision-making process. An advantage of this model is that no once can hide. If a powerful division is absent, it is visible to everyone. Divisions pay lip service to decisions, at both operational and senior levels, then go ahead and do their own thing. There is no single final authority, so accountability is not clear. Decision-making can be very slow. Representatives at the operational level need to check with their senior management at many points along the process. Apparent decisions get reversed when someone comes back reporting that their management does not agree. That said, assuming people play the game openly, this model can be very powerful during the project phase where it is essential to get everyone on board. Once launch has taken place, the company may decide to evolve to the designated model which is much more efficient, if the owner and dedicated team are good at their jobs and respected by others. The designated model is recommended for organizations with an overly strong consensus-driven, decision-making culture. “Decision by committee” rarely leads to excellence and usually ends up stalling. If this is your case, and decisions are put off month after month because the senior people cannot come to agreement, or because a key person is always missing from the meeting, you may well consider implementing the designated model. This model requires a strong CEO or equivalent, who may need to arbitrate when the owner makes decisions that other senior managers disagree with. If this happens often, it means the model is not working. That may be because true consultation is not taking place, or because of “invisible” political moves and bad faith somewhere in the process. The biggest risk in this model lies in the “owner” role. Ideally, the owner is someone high up in the organization, well-connected to the CEO or equivalent, respected by high-level stakeholders and middle management, and a good communicator. But what happens when that person moves on professionally? It’s safer, but may be less effective, to include this responsibility in an existing role such as CIO, CIO, or something similar. The dedicated, highly skilled team is one of the strengths of this model. This model also makes it easier to integrate external contractors into the team when specific skills are needed. The dedicated team must have a strong leader who works well with the owner. Ideally this person is comfortable with strategic and functional issues, and able to communication well with technical experts. What is your model and how is it working?